This creamy vegan coleslaw is a classic tasting coleslaw made with a few simple vegan ingredients. It’s gluten free, egg free and dairy free too, so everyone can enjoy this creamy comfort food. I must admit, I never even thought to make coleslaw until I started to make vegan pulled pork and needed a vegan coleslaw to top the sandwiches. I always thought of it as a weird side dish that no one really ate, but my family couldn’t get enough. My husband devoured the whole thing and then said, “I used to love coleslaw as a kid and this is amazing!” In the 18 years that I have been with him, he never once mentioned the word coleslaw, but it’s nice to find an old favorite that I can create for him! How do you flavor the vegan coleslaw? I like to flavor my coleslaw with a little vegan sugar, vinegar, and celery seed. 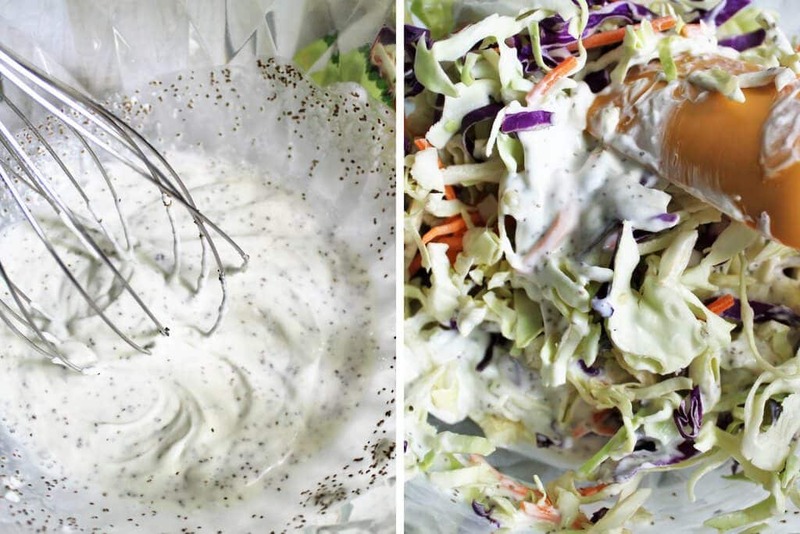 You don’t need to add the celery seed, but I love the flavor that it brings to the coleslaw. How do you make coleslaw vegan? There is not much that you have to do to veganize coleslaw other than to use vegan mayo instead of regular mayo. For this, I like to use my homemade vegan mayo recipe. You can use any vegan mayo that you choose, but I like the flavor of this one and I make it with olive oil to make it slightly better for you. (But, let’s admit mayo is not health food)! Put the vegan mayo, sugar, salt, vinegar, and celery seed in the bottom of a mixing bowl and stir to make a creamy dressing. Add a bag of shredded cabbage and mix well and you are done! You can then serve it immediately or let it sit for about 1/2 hour in the fridge to absorb the flavors and get even creamer. Don’t forget to pin the vegan coleslaw recipe for later! Place all ingredients except for the shredded cabbage in a large mixing bowl and stir until creamy. Add the shredded cabbage and mix well. Serve immediately or let it sit in the fridge for about 1/2 hour to get creamier. You can buy the bags of pre-shredded cabbage or you can shred your own. You can use a mix of red and green cabbage and about 1/2 cup of shredded carrots to add color and make it a prettier salad. Omit sugar to make it sugar-free. I made this to go with the vegan pulled pork sandwich. The were both delicious! I loved the celery seed it this recipe, it really does make the coleslaw! Thanks Sue! I love that celery seed flavor too! Glad that you enjoyed it!